Many police departments get what amounts to a stamp of approval from outside evaluators that review, advise, and ultimately accredit them as adhering to best practices in policing. The Buffalo Police Department is currently not accredited, even though it’s required by the City Charter. The issue of accreditation is more than a technical matter. The process is intended to improve the professionalism and efficiency of police departments, and Buffalo faces numerous challenges in this regard. The department has a middling track record of solving crime, its relationships with the minority community is strained, and its training involving use of force and firearms lags behind many other departments. Why aren’t city police accredited? Performance evaluation of officers is required by the state accreditors, but the city’s contract with the police union does not permit such reviews. City and union officials blame each other for the failure to negotiate evaluations into the contract. Kennedy disputes the mayor’s account. Accreditation, and therefore staff evaluations, are commonplace in police departments big and small. Statewide, 152 law enforcement agencies are accredited with the New York Law Enforcement Accreditation Program, including police departments in Rochester, Syracuse and Albany. The Erie County Sheriff’s Office is also accredited, as are many local city and town departments, including Amherst, West Seneca, Niagara Falls, and the Tonawandas. Cheektowaga has been accredited since 1994. The New York State Law Enforcement Accreditation program is voluntary, but in order to become accredited and reaccredited every five years, agencies must meet 110 standards. These include stipulations on training, records management and criminal investigation. Some departments have sought accreditation from multiple organizations, including the Commission on Accreditation of Law Enforcement Agencies. It accredits law enforcement agencies around the world, including over 480 in the United States. They include six in New York State, including Albany. Rochester was accredited from 1987 until 2012. Kennedy of the Buffalo police union said accreditation has the potential to make the police better. “It’s just making sure that you’re number one critical demand from the public—safety and security—is met at the highest possible proficiency level,” he said. He added that performance evaluations could help identify officers for promotions and identify those who engage in misconduct. Although Kennedy said he is willing to meet with the mayor, he remains concerned about the potential for politics to influence the evaluation process since the mayor appoints the top brass of the department. And Kennedy said he thinks other issues should be addressed first. Others say accreditation could help the department make needed improvements. “Trends in policing come and go. Some of them don’t seem to leave Buffalo,” said Sam Magavern, co-director of the Partnership for the Public Good, a social justice advocacy and research group in Buffalo. Training is one aspect of police operations that would benefit from accreditation. Investigative Post reported in October that the department has failed to update its training of officers in the use of force and weapons. Many department across the country have improved this type of training to de-escalate potentially violent encounters with civilians and avoid Ferguson-type situations. Buffalo’s training falls short of what’s required by state accreditors. For example, it recommends training of officers in real-life situations, while Buffalo uses written tests and and target practice at a firing range. The department’s use of force and de-escalation training standards came into question when, officers intentionally struck a civilian threatening police with an SUV to defuse the situation on New Year’s Eve. An attorney for the police union said the tactic is not standard protocol. Improving relations between police and the community might also benefit by accreditation. Less than half of the city’s black residents would feel comfortable calling the police in an emergency, according to the survey on community-police relations administered by Open Buffalo. Solving crime is another issue confronting the department. 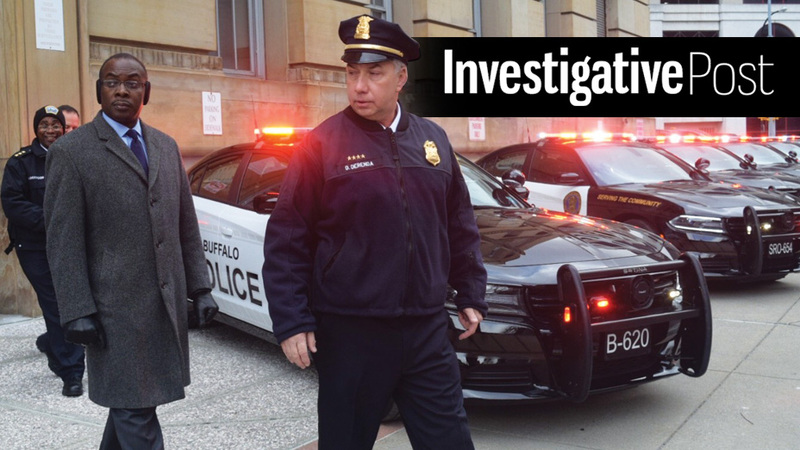 Eight of 10 major crimes committed in Buffalo go unsolved, an Investigative Post analysis found last year. Buffalo clearance rate for seven major crimes, according the FBI statistics, ranked 18th worst among 77 cities that are similar in size to Buffalo. There’s a particular problem with solving homicides: Buffalo’s clearance rate for homicides was 23 percent. Nationally, about two-thirds of murders are solved through clearance..
“That’s been an issue here in Buffalo, failure to solve murder cases,” said Magavern. The Common Council’s has an opportunity to weigh in on the issues of training, accreditation, and performance evaluations when its Police Oversight Committee meets January 24. Daniela Porat is a reporter for Investigative Post, a nonprofit investigative reporting center focused on issues of importance to readers in Western New York.